So, gearheads, I have recently returned from a 5 week trip to France, Sweden, and Dubai with my family (in France) and my wonderful girlfriend (the whole trip). And while this was certainly the trip of a lifetime for many reasons, it was also the ultimate car enthusiast’s trip. I saw so many cars and did so many things that I’d never done before. 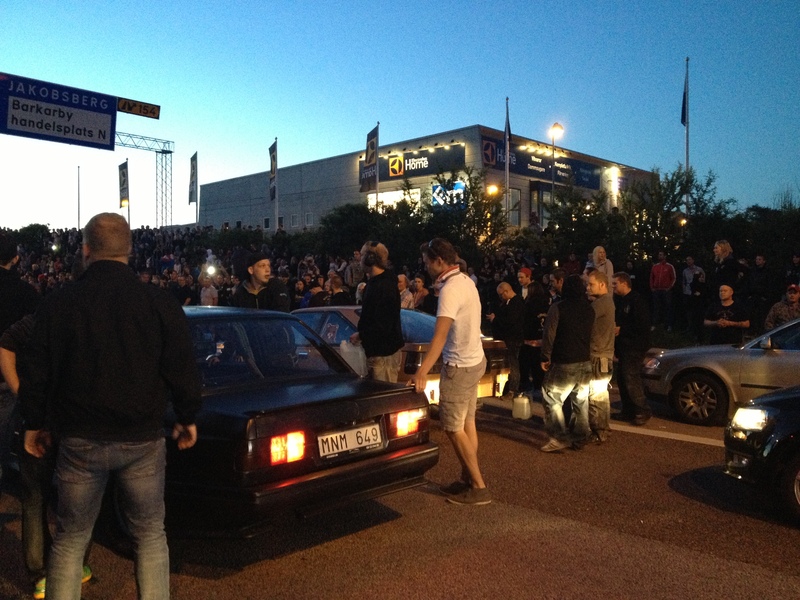 So I’ve decided to kick off my recollections of this trip’s events with the story of the illegal drag racing scene in Sweden, and how freaking awesome it is. It all started upon our arrival to Sweden, where we were hosted by my girlfriend’s brother, Mathias, and his family. He’s a successful owner of a contracting company and a big gearhead as well, so we got along just fine from the start. 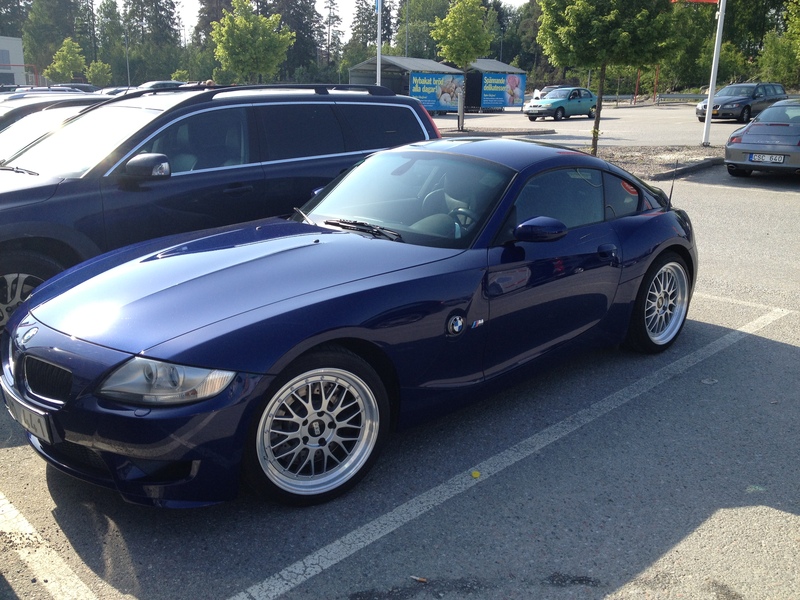 He also has the pleasure of owning a BMW Z4 M Coupe with straight exhaust pipes and 360hp on tap. It is one of the most beautiful and brutally fast cars I’ve ever seen, and it makes a sound like no other. Upon noticing my excitement from riding in this magnificent vehicle, he asked if I wanted to go see the races on Friday night. I had no idea what he meant, but I figured a guy like him would know what he was doing when it came to this. Alas, I anxiously awaited Friday evening, while keeping myself busy exploring the beautiful city of Stockholm. Friday finally came, and we spent the afternoon washing the Bimmer so that it would be immaculate in the eyes of the many racing fans who would be attending. At this point, I was still blissfully unaware of what I was about to witness. Would it be some simple cone-led track racing at an old industrial park, or something more reckless? What I saw, though, was well beyond my expectations. 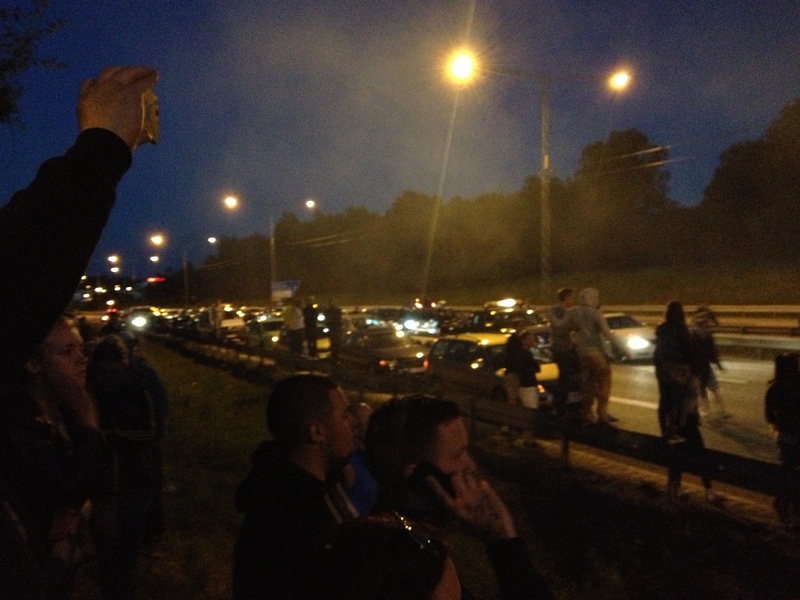 We were on our way to an illegally-operated drag racing tournament for 32 drivers and their 1000+hp cars. Mathias tagged along in the Bimmer behind his friend and next door neighbor, Rasmus, all the way to an outlet mall on the North side of Stockholm. Soon enough, we were parked by a Toys R’ Us, and walked through a string of project cars to the loading dock area. It was then that I caught a glimpse of what I will refer to herein and forever as the Black Beast. Before me stood a 1200hp BMW E3o 3 Series painted matte black seemingly by a team of children with spray paint. It had the biggest set of drag tires I had ever seen in person, as wide in diameter as one of pregnant Kim K’s thighs. It even had three parallelograms cut out of the hood, presumably to keep the whole thing from getting so hot it melts the entire Arctic Circle. It was equipped with a roll cage, you know, for safety or something, and the interior was as devoid of content as Miley Cyrus’s skull. It even had sandbags in the trunk for, you know, grip. This car was driven by a man who was only known to me as Kee-mo. Or Kimo. Or Chemo. I’m not sure which because it was only a verbal introduction, so I’ll just go with “Chemo.” Chemo was apparently the runner-up in the previous 32 car tournament, and was looking to win it all this time. So while his grease monkeys got the car ready, he waited for the call that it was his turn to race. This call finally came, and when it did, everyone in his entourage ran to their cars, and headed out towards the highway, with the Black Beast leading the way. I was already quite surprised but what I had seen, but what came next was utter insanity. All of us, in our herd of automobiles, fanned out across the highway right after the entrance ramp, 4 lanes wide and 3 cars deep in each lane, ensuring that no local traffic could pass through and disturb the race. The two contenders, lined up just under the highway signs in front of hundreds of race fans just hanging out on the side of the highway and climbing up the signs to get a better look. As I stood in wonder, trying to take in all that I had been witnessing, I was yelled at to come help warm up the tires. So I ran hard over to the Black Beast and pushed down even harder on the top of the trunk, while one of the crew members poured water under the tires. 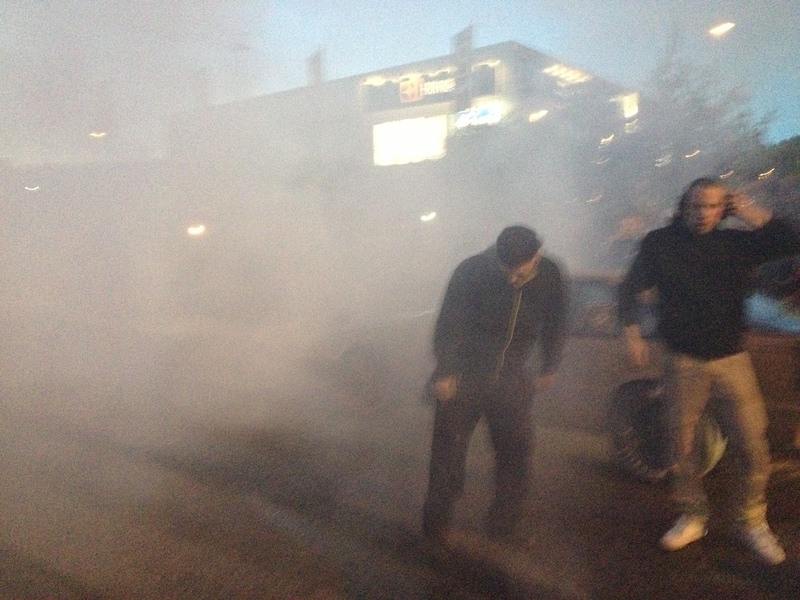 Chemo then floored it, until Kim K’s thighs created the thickest, smelliest tire smoke I assume has ever been created. I kid you not, this is why global warming is an issue at all. As Chemo sped off, his tires properly warmed, we promptly hopped over the guard rail and took our places at the starting line, cameras at the ready. The cars took their place, led by the start man, and as soon as he dropped his arms the race was on. It was the loudest, fastest display of DIY racing that I have ever seen, and probably will ever see in my life. Chemo won with ease, and before we had time to celebrate, it was time to run back to our cars and clear the highway in case any unexpected men of the law crashed our party. As we sped off down the highway, Mathias and I laughed from the pure rush of adrenaline, and he asked me “so, how about that, yah?” I was speechless. 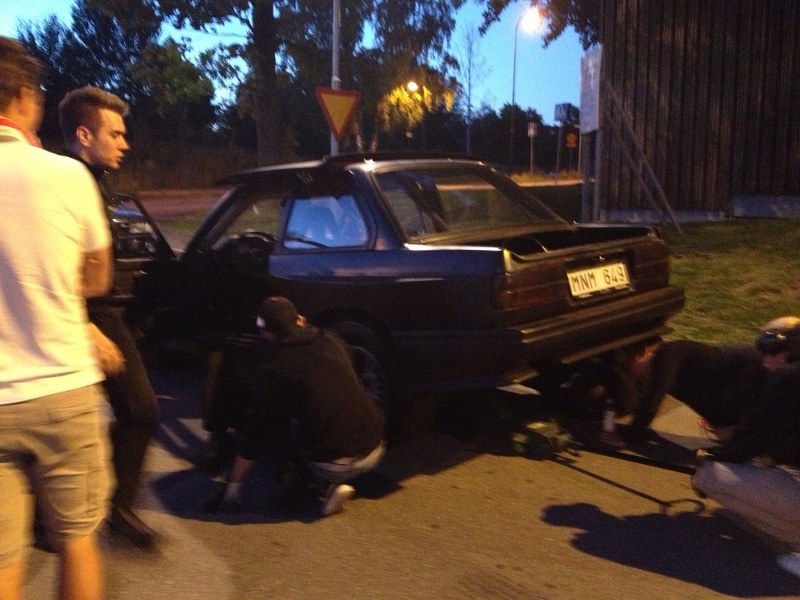 We rendezvoused with the team behind a nearby Ikea (typical, I know), where Chemo and his crew were performing repairs on the car. Apparently the rear differential had been shot from the race, and they were attempting to fix it before the next call came it. To my, and many others’ dismay, they could not. The Black Beast was defeated, by nothing but its own sheer might. But our night at the races was far from over. We witnessed a few other races, won by such unlikely contenders as a mid 90s Audi wagon, a Mitsubishi Colt hatchback, and a Volvo sedan. It was an astonishing display of homemade horsepower and a rebellious spirit. Everyone showed up to the races in their best car, whether that be their backyard project or their race-spec Porsche. All in all, it was one of the coolest experiences I’ve ever had, and something I will remember forever. Keep racing, Swedes. I’ll be back to check it out again.